Blurb From Goodreads: On the faded Island Books sign hanging over the porch of the Victorian cottage is the motto “No Man Is an Island; Every Book Is a World.” A. J. Fikry, the irascible owner, is about to discover just what that truly means. 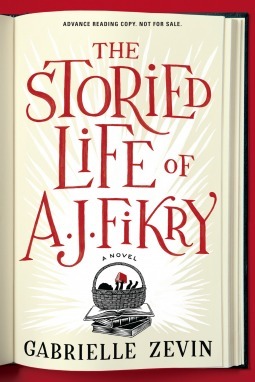 Why Read: The Storied Life of AJ Fikry came into my life in a number of ways, surprisingly similar to Goldfinch in that regard. It was mentioned in my favorite book podcast of all time, Book Riot, and before I had really the time to discover more about the book, it came up on NetGalley… and who am I to say no to books about books (my favorite genre)? Review: It’s difficult to know where to begin. You have no idea how much it pained me not to give this book a 5 star rating. Although a book review is really one of the most subjective things in existence to write, sometimes a book can affect you in ways that just can be so difficult to discount, even though your realize it is a personal experience. For me: A Storied Life was exactly that: the kind of book that grabs you by the coattails and doesn’t let go, but it wasn’t exactly in the way that might have appealed to other people. What really surprised me was the plot twist (I’ll call it that) which happened so suddenly and ended so quickly that threw me for a loop. Not that I didn’t appreciate it, but the moments felt frozen as I was reading it. I suppose that in itself is a testament to the characters power, a simple bookseller whom I really didn’t feel like I would connect with at all (after all, how could I? He was a widower and a lone shop owner, none of which I feel related to) – ended up being the character that I cared about the most. AJ was loveable and Maya was cute. I’ll admit, I didn’t like a particular character: the sister of AJ, but as the plot moves along quickly despite my fear that it wouldn’t given the setting of an old town, I grew to understand why she acted the way she did. Daniel Parish. Ugh. I didn’t really care so much for his subplot, but what you can do – I suppose that would have spoiled the ending of the story – but one thing I didn’t like of the book was that my dislike of him really changed which subplot I saw as dominant. But in stories like this, it’s really about the plot. The idea that one can adopt a young girl and raise her within a bookstore. I mean, what an amazing childhood that must have been. I can’t imagine a better place to spend all of your down time. It moves quickly, her childhood, but it seemingly combines all the love I felt for books throughout my childhood and the deeply personal connections that you can make with characters, fictional and real. I’m not sure if I missed the main point of the story, the mystery of Maya’s parentage. Because that is a main subplot, but for me: my mind was very focused on the life of AJ, how it was completely turned around because of one young girl and the actual love after being widowed. It’s difficult to describe how I felt when he gets older, and some particular pages that really touched me. But please read it. While I’m sure this was biased because there were some particular sections I just couldn’t help but cry at, I promise you – you’ll like it.